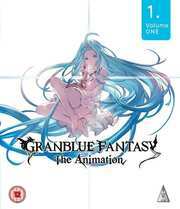 Based on Cygames' epic fantasy mobile RPG that has amassed a following of over 14 million players, GRANBLUE FANTASY The Animation brings all the fun to your TV! Watch as all your favorite characters adventure together into the blue, and beyond. Gran and Vyrn live on the sleepy, far-flung island of Zinkenstill. Their quiet lives are rocked by the sound of a sudden explosion and the sight of a battleship in the sky. They follow a light that falls from the battleship into the forbidden woods, where they encounter a mysterious girl.